The Centre Pompidou, informally called 'Beaubourg' by many Parisians, is a cultural center and museum dedicated to modern and contemporary art. Spanning various mediums, the creations displayed at the Centre Pompidou include visual art, books, design objects, music and film. Along with the Museum of Modern Art in New York and the Tate Modern in London, the Centre Pompidou houses one of the largest modern and contemporary art collections in the world. The museum was named after Georges Pompidou, the French president who was responsible for its creation. Inaugurated in 1977 after Pompidou's death in 1974, the museum has consistently attracted large numbers of visitors. In 2011, for example, the Centre Pompidou welcomed more than five million people. 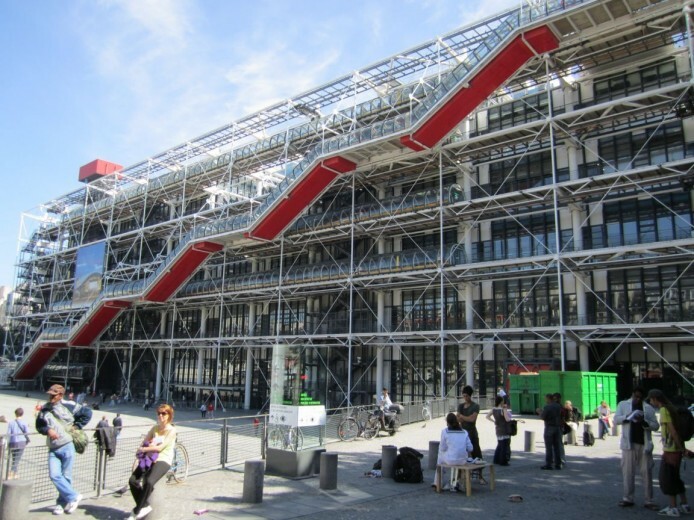 Situated in the Beaubourg neighborhood — the area that gave the museum its informal nickname — the Centre Pompidou's structure attracts attention because of its unusual design. The building was designed by a group of British and Italian architects and was highly controversial at the time of its development. With a wall of large, multicolored tubes acting as the exterior of the museum, the bright design doesn't shock anymore even the more traditional Parisian residents. A number of notable temporary exhibitions have taken place at the Centre Pompidou throughout the years, including events dedicated to Salvador Dalí, the Dada movement, Andy Warhol, and Edvard Munch. In addition to the museum, the Centre Pompidou also houses an enormous, multi-level library packed with books from all genres.